Win: Macbeth - Shakespeare's tragedy like you've never seen before | SWITCH. Prepare to witness Shakespeare's 'Macbeth' like you've never seen it before. From the Academy Award-winning producers of 'The King’s Speech' and acclaimed director Justin Kurzel comes a visceral and visually breath-taking retelling of the classic tale. 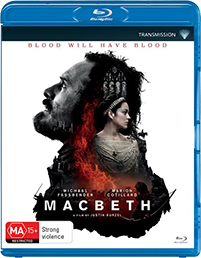 'Macbeth' is an epic cinematic experience starring Academy Award nominee Michael Fassbender and Academy Award winner Marion Cotillard, Paddy Considine, Sean Harris and Elizabeth Debicki.